This past May we began to talk about the new model that Apple wanted to open stores worldwide. Gradually we have seen how the company has been giving prominence to the crystal in the architecture to remove the barriers which divide the street with the interior of their stores. This will be the model arising from the new Apple Store located in the Californian city of Palo Alto. Located just a few blocks from the old store, the new location will be much larger and have a greater number of employees. The restaurant will open officially on Saturday at 10 AM (Pacific Time) and commemorative T-shirts will be given away to the first 1000 visitors entering the site. 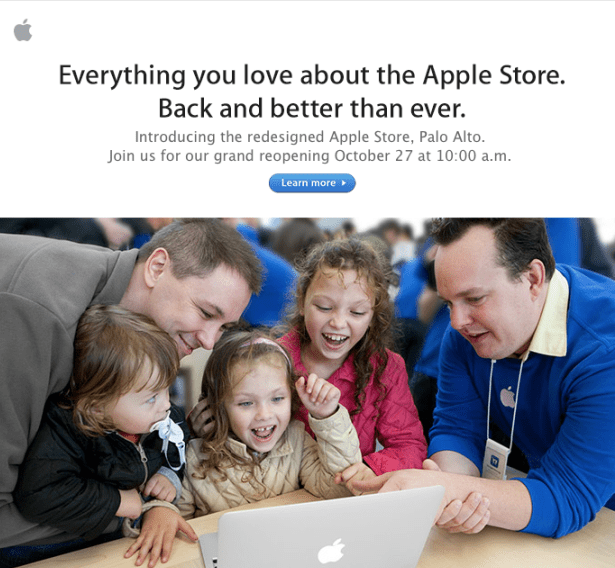 The company's customers residing in the area have already begun to receive e-mails informing them of the grand opening. We will keep you informed with the catch of the site as they become available. Article The new Apple stores will open this Saturday in Palo Alto was originally published in News iPhone .